Samsung has finally unveiled the rumoured supersized "phablet" that we all knew was coming. But rather than opting for a new Galaxy Note, the Korean company has instead revealed a brand new handset. The Samsung Galaxy Mega will come in two massive screen sizes - 6.3-inches and 5.8-inches - and should arrive in the shops here next month. We've got a full range of specs to chew over, but first, lets just begin with the screen. By anyone's standards, 6.3-inches is huge - we first had an inkling that Sammy was opting for this size when the company revealed the Game Pad accessory for the Samsung Galaxy S4. At only 0.7-inches off the Samsung Galaxy Tab 2 7.0, the Galaxy Mega's screen is a capacitive, 720p affair (qHD on the 5.8-inch) but without the S-Pen functionality of the Note series. You'll have space for five app shortcuts in a row and enough screen real estate for everyone around you to watch Game of Thrones over your shoulder. There's a 1.7GHz dual-core processor inside the Galaxy Mega, along with 1.5GB of RAM and a choice of 16GB of storage. The 5.8-inch model dials things down a smidge, with a 1.3GHz processor and only 8GB of storage. The rest of the specs are pretty mid-level, and won't compete with the flagship Galaxy S4 arriving on April 26th. You've got a microSD card slot for storage expansion, IR functionality for controlling the tellybox and an 8MP rear-facing camera. As you'd expect, both will arrive running Android 4.2 Jelly Bean. 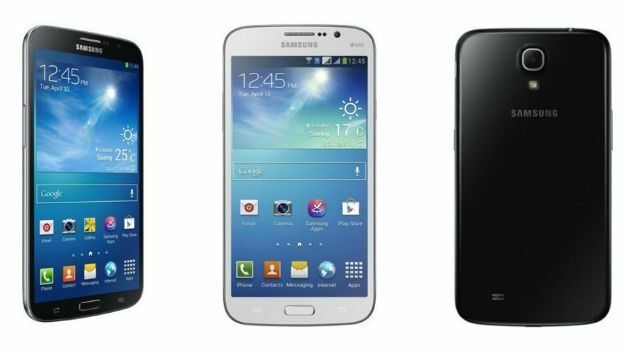 Samsung hasn't mentioned anything about pricing yet - but we'd expect the Galaxy Mega to sit below the Galaxy S4 and the Samsung Galaxy Note 2 in the company's line-up. Good news is that Europe is getting it first - sometime in May - with other regions to follow soon after. Neither the retailers nor the networks have revealed any kind of pricing yet, but we'll let you know as soon as we hear anything. What are your thoughts on the Samsung Galaxy Mega? Do we really need a phone with a 6.3-inch screen? Let us know in the comments below.